Today’s lunches are definitely winter-focused. We got half a foot of snow on Tuesday night, so lots of snowflakes in the lunches, to match the snow outside. Plus, we only have 6 days left until Christmas! I’m wishing I had more Christmas bento supplies (especially more star cookie cutters and Christmas food picks), but we’re making do with what we have. G2 has another lunch of MOMables-inspired homemade gluten-free crackers – these are being devoured! In the large, bottom section of her Easy Lunchbox she has the crackers and cheese cut into snowflake shapes in two silicone heart cups. As a decoration, she also has an angel and a Christmas tree also cut out of provolone cheese and decorated with food-safe markers. At the top left, in the smallest section she has two penguin sugar cookies that she decorated very quickly, plus a mitten snowglobe food pick. At the top right are some Honeycrisp apple sections with a snowflake pick. G3’s lunch also has a wintery theme, but otherwise it’s very different. In her Laptop Lunchbox she has (clockwise from top left), a snack of a star sugar cookie and, in a silicone heart cup, half of a clementine with a snowflake. Next she has a sugar cookie we cut in the shape of Snoopy and G3 decorated. Below that is another half a clementine with a snowflake pick. Finally, in a silicone heart cup she has a few American cheese angels and some crackers, then some ham roll-ups with a mitten snowglobe and a snowflake. G3 also has a Snoopy bento box with some Cape Cod bbq potato chips. And now I’m hungry after writing about their lunches. Yum! Today we only had two lunches again (G1 is still sick, and is going to the dr. later). G3 is on a field trip, so she needed to pack a completely disposable lunch. G2 is the only one with a “normal” lunch, and hers is special because she’s doing a “shadow day” at a local Catholic high school. I hope the kids there think her lunch is cool, like the kids at the Charter school do, rather than thinking it’s weird. Crossing fingers on that one. G2’s theme for the day is Angels. I wanted her to remember that Heavenly Father is watching over her, and she’ll be ok. She doesn’t like large groups of people, and she doesn’t like new situations, so while she had a tour of the private school and took a test there, she had never been there without me. In her Easy Lunchbox she has a couple silicone heart cups. Each cup has cheese and homemade gluten-free crackers, alternating angels and rectangles. Also in the large section is an American cheese sun at left and 4 singing provolone cheese angels below. The faces on the angels were made with food-safe markers. At top right she has a slice of chocolate cake with a fondant candy cane and alphabet food picks spelling out ANGEL (the G was mistakenly made as a Q – in one set of letters I have no G and 2 Qs). At the bottom right is a clementine with a snowflake pick stuck in it as an accent. G3’s completely disposable lunch is packed into a “family size” cherry tomato container from BJs. She has two Juicy Juice fruit punch drinks (one for snack and one for lunch). For fruit, she has a clementine with a polar bear homemade food pick and an applesauce pouch. Her protein is two ham roll-ups held in place with a bunny and an arctic fox food pick. Finally, she has some Cape Cod barbeque potato chips and a Frosty cupcake. Elves, Snowmen, and Reindeer, oh my! This weekend we had multiple Christmas parties to attend. We were invited to 4, two were cancelled due to a snowstorm, and one new one popped up, so we went to three. Two required us to bring dessert, so we made a Christmas tree cake and some snowmen cupcakes. Very fun! Of course, one of the cancelled parties is being rescheduled for next week, so we can make another set of cupcakes for that. We ended up with quite a few leftovers, as many other people brought desserts, so you’ll see cake and cupcakes in place of cookies in lunches this week! After the multiple parties, I ran out of steam, so lunches are pretty simple today. 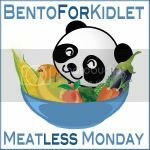 This is our Meatless Monday post, so none of the lunches have any meat in them. After G2 went vegetarian the whole family started to eat less meat, which is working out very well for all of us. Well, except for G3, who adores meat of any kind. G1’s lunch is a Thermos, full of tomato soup, plus some treats in her Totoro Bento Box. The vented section at the bottom left has a EasyLunchboxes Mini Dipper with pineapple chunks, and a snowman cupcake. The sealed section at the top right has two tofu reindeer. When I get a new package of tofu, I slice it long-ways into four large slices. For the reindeer I took one of those slices and cut it into 4 triangles. I stacked the triangles on top of each other to make 2 reindeer. I found some reindeer horn food picks at a local shop, and used them, plus food-safe markers, to turn the triangles into reindeer. Easy and fun! I was really excited about G2’s Elf lunch, but it doesn’t look as good in the picture as it did in real life! *sigh* Anyhow, in her Easy Lunchbox she has a provolone cheese and mustard sandwich on gf bread cut into the shape of an elf and then an elf hat (hat was made by cutting the curves off a heart and turning it upside down). I used provolone, face-punched nori, and soy paper for the details. I also cut two snowflakes out of provolone and added a snowflake pick for fun. At the right she has half of a Honeycrisp apple with the word ELF cut into it using a paring knife. She also has some of the cake and the angel from the top of it in the larger side section. G3’s lunch is also simple. In her Easy Lunchbox she has a grilled cheese on gf bread cut into the a Santa or elf hat and as well as a snowflake cut out of sliced mozzarella cheese. She has the other half of the Honeycrisp apple with the word ELF cut into that, as well. In the final section of her Easy Lunchbox she has a snowman cupcake. In her Snoopy bento box she has a clementine and a slice of cake with a star on top inside a silicone heart cup. 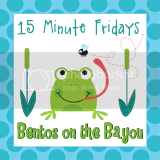 This post was linked on Meatless Monday and What’s for Lunch Wednesday and Bento Blog Network – Snowmen. Today G2 had leftover Corn & Bean Quesadillas for lunch, and despite some wintery food picks, it never looked very festive. I forgot to take a picture of it, too. Her sisters’ lunches are a bit cuter. My 3 week long migraine is taking its toll on my creativity. G3’s lunch is packed into an Easy Lunchbox. In the large section she has a B(no L, no T) sandwich cut into the shape of a stocking. G3 rarely eats the bread in her sandwiches, so I stuffed a bunch of bacon into one slice of bread cut into two stockings. The snowflake pick holds the sandwich together, and the mittens snowglobe food pick adds some festive-ness. At the top left is a vegetarian rice krispie treat with mini Christmas MnMs and a polka dot food pick. In the larger top section there are some Honeycrisp apple sections with a princess crown food pick. At right is a Snoopy bento snack box, and packed inside is a snack for G3. She has another rice krispie treat in a silicone cup as well as some more Honeycrisp apple sections with the word SNOW written with alphabet food picks. G1’s lunch is flakes. Sadly, not the Cadbury Flake. But, this is healthier, I guess. Definitely less chocolatey, though. In her Snoopy bento box she has some pineapple in a mini dipper and a rice krispie in a silicone cup, both of which have polka dot food picks. In a Laptop Lunch Bento Buddies container G1 has 2 large snowflakes cut out of tofu, a snowflake pick, and the word FLAKE spelled out in alphabet food picks.